Ms. Cupcake » Treat Your Dad This Father’s Day! Ms. Cupcake > News > Cupcake News > Treat Your Dad This Father’s Day! What better way to show someone you care than with cake! Here at Ms. Cupcake, we think it’s the best gift you can give! 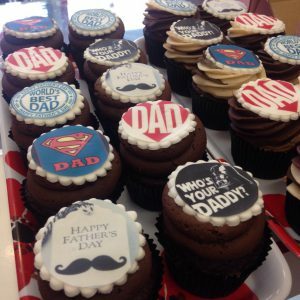 This Father’s Day we’ll be making specially designed cupcakes with different images for the special day (see below for some examples!) How about picking up one of these beauties along with some other sweet treats such as Brownies and Cookie Sandwiches! Father’s Day cupcakes will be available in store from Friday 15th – Sunday 17th June! This entry was posted on Wednesday, June 13th, 2018 at 3:43 pm and is filed under Cupcake News. You can follow any responses to this entry through the RSS 2.0 feed. Both comments and pings are currently closed.